Celebrate International Women’s Day with REED (Resist Exploitation, Embrace Dignity) at our fourth annual fundraiser for sexually exploited women: Raising Hope. 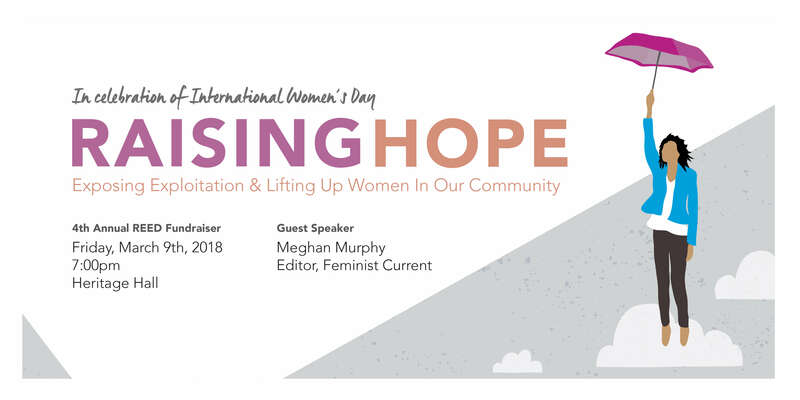 Freelance writer and journalist Meghan Murphy (founder and editor of Feminist Current) will speak at the event and live music will be performed by local blues funk trio The Casting Crew. Mary-Lee Bouma, co-director of REED, will speak briefly too about REED’s mission and values and you’ll have the opportunity to sustain our work. You’ll also have the opportunity to meet others who care about justice and women in our city. REED stands with and for sexually exploited women and challenges the demand for paid access to their bodies. This event will be bold and inspiring and will celebrate our work and the work of abolition allies against patriarchy and exploitation. At the event REED will honour someone from the community, who we believe has made an outstanding contribution to resisting exploitation and embracing dignity, with our fourth annual REED award. The event has capacity for 150 people and 50% of tickets have already been sold. Purchase tickets online through Eventbrite. Tickets will be sold at the door only if available. Ticket price is $20 plus fees and includes light appetizers. Beer and wine will be available for purchase.